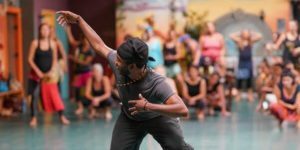 You do not want to miss this day-long Guinean workshop with Master Teacher Naby Bangoura and friends. Invite your family and village to come explore the riches of Guinean culture through various forms of dance, drumming and percussion, song, storytelling and performances. Guest teachers will offer sessions on the dundun, djembe and balafon and there will be dance classes tailored to all levels, beginners and advanced alike, as well as sengbè. Naby will be offering a special program for children and we will enjoy an African-style meal together as a community. Fairfax Streets for People Coming up Soon! The sixth annual Fairfax Streets for People encourages playfulness and creativity in the open street in downtown Fairfax for the afternoon of SUNDAY, August 27, 2017! Sustainable Fairfax and the Fairfax Chamber are hosting the sixth annual Streets for People; an Open Streets event in downtown Fairfax, on Sunday August 27, 2017 from 10:00 am to 4:00pm. 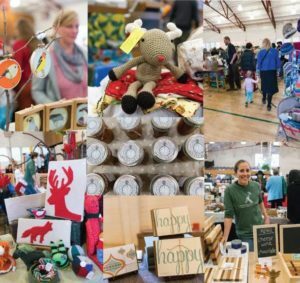 The event transforms Bolinas Road in downtown Fairfax into a lively car-free space for a day. FOOD, MUSIC AND FUN: Catch live music, grab a bite to eat or drink at an outdoor café, find a new outfit at the clothing swap, take a free yoga class, get creative with chalk art in the street, chair painting or other art projects, try out a temporary tattoo, connect with friends, join a dance class… or just dance… and more! This year, there will be a SUMMER OF LOVE flavor at this event, and you are encouraged to dress the part! There will be open dancing to 60s music- schedule coming soon. YOUTH MUSIC SHOWCASE: This year the Youth Music Showcase will be in Bolinas Park featuring young talented musicians and singers. There will also be fun activities in the park for youth and adults alike, including hula hooping- a tradition at Streets for People. EDUCATION: Outreach tables by nonprofits and local agencies will provide information and resources focusing on sustainability and community. TRANSIT ALLEY: The event celebrates alternative transportation and will feature Transit Alley, with biking, walking and public transportation related exhibits as part of Sustainable Fairfax’s ReduceX2 campaign. You will have the opportunity to practice loading a bike on a Golden Gate Transit bus and enter a drawing for free bus passes! ZERO WASTE: Bring your reusable water bottle to the US PURE WATER water station. Also be sure to use the silverware provided by Sustainable Fairfax at the food stands on the street (and place them in the buckets provided after use). There will be composting and recycling stations available on the street. BIKE, BUS OR WALK TO THE EVENT! Free bike valet service will be provided in the parking lot next to Gestalt. The event is a collaboration of Sustainable Fairfax, the Town of Fairfax and the Fairfax Chamber of Commerce. For more information on Streets for People, visit the Streets for People website. Help us make Streets for People a success! Sign up to volunteer here. 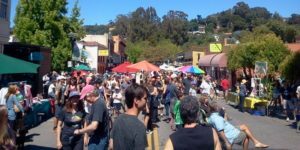 Find resources and information on Open Streets Events at http://openstreetsproject.org/. Thanks to the generosity and community spirit of Iron Springs we have been chosen to receive a portion of the proceeds from the pub on Tuesday, February 7th. We are excited for this wonderful opportunity and invite you and your friends to have a great meal, a pint or two, learn about Sustainable Fairfax, and feel good that your money is staying local. Kitchen is open until 9:30pm. Call 415-459-4672 for reservations of 6 ore more people. Be sure to get your raffle ticket for an Alite Barrel Handlebar Bike Bag ($2 per ticket or 3 for $5)! A part of Alite’s “Rope Collection”, their Barrel Bike Bag is an innovative and highly versatile duffel. Use the built-in bungees to strap it to your handlebars while riding for free and easy pedaling, then sling it over your shoulder via the messenger-style strap to continue your journey on foot. Dr. Klaper will show how our food choices impact not only our health and well being but our ability to reverse climate change and heal the planet. This Community Conservation is presented by 350Marin.org and supported by many organizations including Sustainable Fairfax.